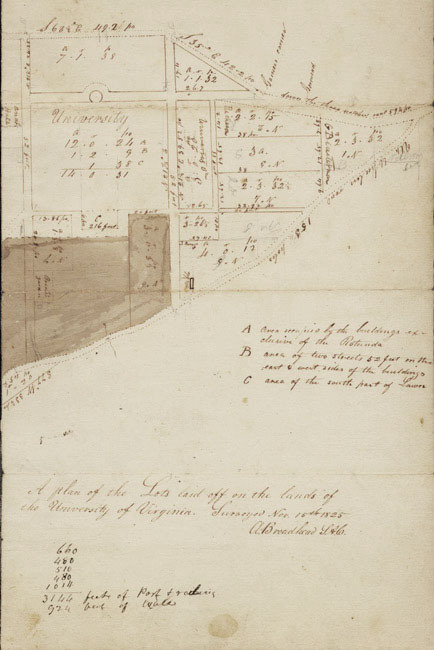 Achilles Broadhead, a local justice of the peace, militia captain, and surveyor for Albemarle County, plotted the original grounds of the University a few months after the first students enrolled. The plat shows the University bounded by the old Three Notched Road to Richmond, now Route 250, and Wheeler's Road which became Route 29 South. Just outside the central grounds is a building labeled "Anat. Hall," or Anatomical Hall, later torn down to make way for the construction of Alderman Library.